Luxury bath products manufacturer Victoria + Albert has expanded its Washstand Collection with two new products that come with quartz countertops. Designed by Italian design duo, Meneghello Paolelli Associati, Metallo 61 and Metallo 113 Quartz Washstands feature brass construction, polished chrome finish, and a choice of three quartz finishes with undermounted basins. The company says the shape of the legs, which feature right angle “tee joints” that reference traditional bathroom pipework, characterizes the washstands. 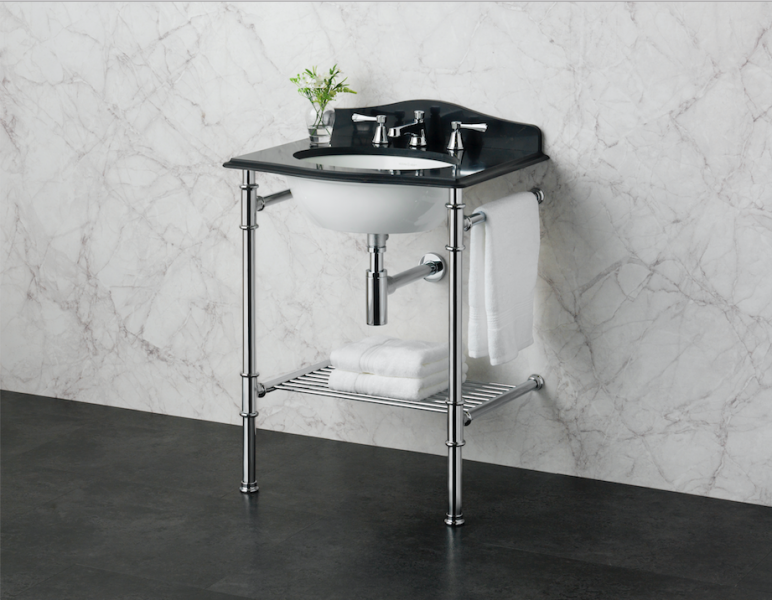 Metallo 61 Quartz is the most compact washstand in the collection at 24 inches wide, making it a good choice for small bathrooms and powder rooms. It features a quartz surface with a curved ogee edge and an optional quartz upstand. The unit includes an undermounted Kaali 46 basin with a built in overflow. Metallo 113 measures 44¼ inches and also features a curved ogee edge, a quartz upstand, and comes with an undermounted Rossendale 91 basin overflow. As with all products from Victoria + Albert, the Kaali 46 and Rossendale 91 basins are made using the brand’s Englishcast, a blend of Volcanic Limestone and high-performance resins.